Litigation refers to the act of enforcing one’s rights by means of the Courts. The courts in South Africa are divided into lower courts and superior courts, each with their own threshold of which matters they are empowered to adjudicate upon, as well as which area they will serve. Most litigation in the republic takes place in the Magistrates’ Courts, which are lower courts and generally entertain matters that are less serious than those heard by the superior courts. Litigation may be a costly and time-consuming exercise. It is therefore imperative that a litigant adopt a measured and calculated approach to any action proceeding by means of the courts. Magistrates’ Courts are the lower courts in the Republic and consequently deal with the bulk of legal cases. 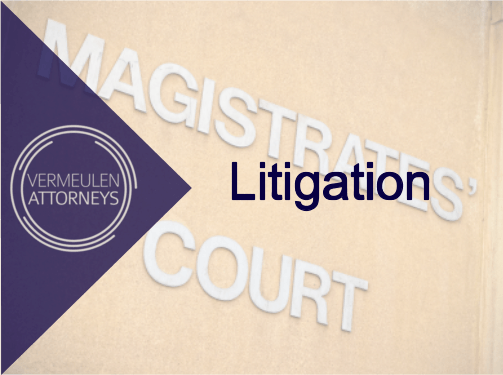 Since there are many more Magistrates’ Courts in South Africa than High Courts, cases in the Magistrates’ Courts are often finalised much quicker than those in the High Courts. Magistrates’ Courts are divided into Regional and District Courts, each with their own powers and thresholds. What is very important to bear in mind is that Regional Courts are now empowered to grant a Decree of Divorce in certain circumstances, which is of course much more cost-effective than approaching a High Court. High Courts fall under the category of Superior Courts, and are the Courts that usually deal with more serious cases. There are currently various divisions of the High Court in South Africa, and these divisions are only bound insofar as the area in which they possess jurisdiction. Attorneys used to exclusively make use of Advocates for purposes of High Court litigation. Though this is still a practice to a certain extent, some attorneys now personally appear in the High Court by virtue of legislation which was passed in the 1990’s which empowers them to do so. At Vermeulen Attorneys we believe that the question of whether an advocate should be employed is one that should be answered by considering the merits and the level of complication of a given matter, and not by simply employing or declining to employ an advocate by default. We possess a high level of experience in litigating and appearing in the High Courts, and therefore take pride in being able to advise our clients whether employing counsel would be necessary and appropriate.